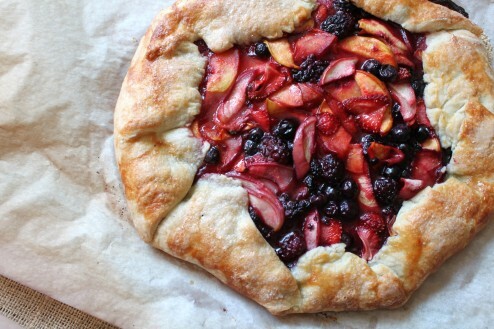 I have been wanting for some time now to make something sweet with peaches and while I was originally going down the cobbler route, I decided to make a galette or rustic tart. It looks genuine, delicious and not pretentious at all. Its the dessert for real life. The great thing is that with the aid of a food processor the pastry dough is really easy to make and the absolute best part about it all is that you don’t have to be perfect – its rustic remember. Overall the pay off on this dessert is well worth the effort. Here is all of my fruit mixture. I used white and regular peaches. I didn’t bother with pictures of making the pastry. Flour is boring. Place your rolled out dough on a cookie sheet. 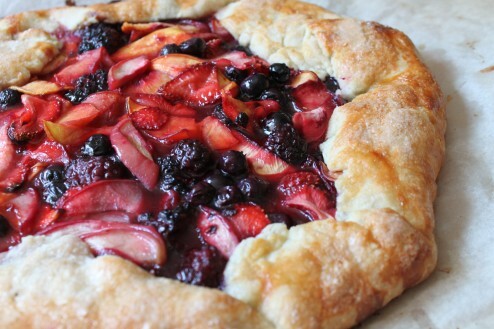 Spoon your fruit mixture into the center of the pastry and spread out leaving 1 inch clear. 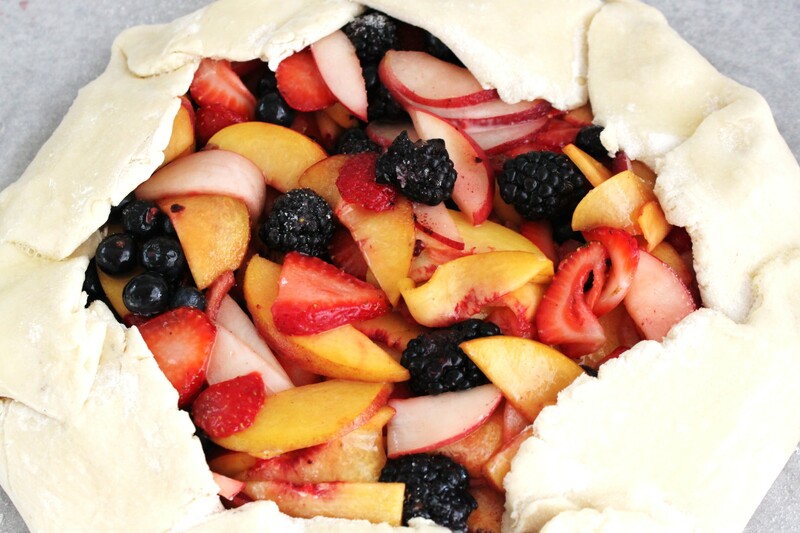 Begin to pleat your dough around the fruit. Wash with egg white and sugar. Let it cool a bit before you take a bite. Trust me. One more view. I can’t get enough. 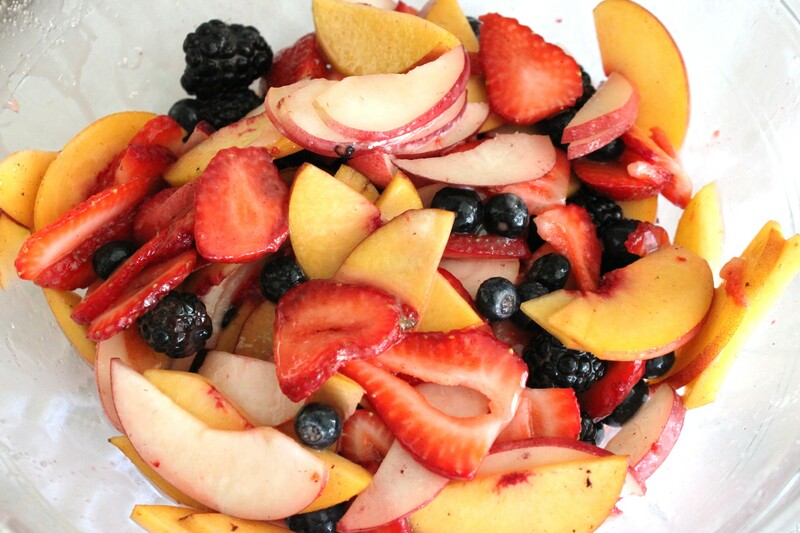 Sweet peaches and tart berries are a wonderful combination. Sweet but not too sweet, pretty darn perfect. In a food processor, combine the 1 1/2 cups of flour with the candied ginger and salt and pulse to mix. Add the butter and pulse until it is the size of small peas. Sprinkle on the ice water and pulse just until the pastry starts to come together. Turn the pastry out onto a lightly floured work surface and pat it into a disk. Wrap in plastic and refrigerate for 2 hours, or until firm. Line a large baking sheet with parchment paper. On a lightly floured work surface, roll out the pastry to a 14-inch round about 1/8 inch thick. Fold the pastry in half and transfer it to the prepared baking sheet. Unfold the pastry and refrigerate for 15 minutes. Preheat the oven to 375°. In a large bowl, mix the 1/4 cup of sugar with the lemon zest and flour. Fold in the fruit and lemon juice and let stand for 15 minutes. Spoon the peaches and berries in the center of the pastry, leaving a 1 1/2-inch border all around. 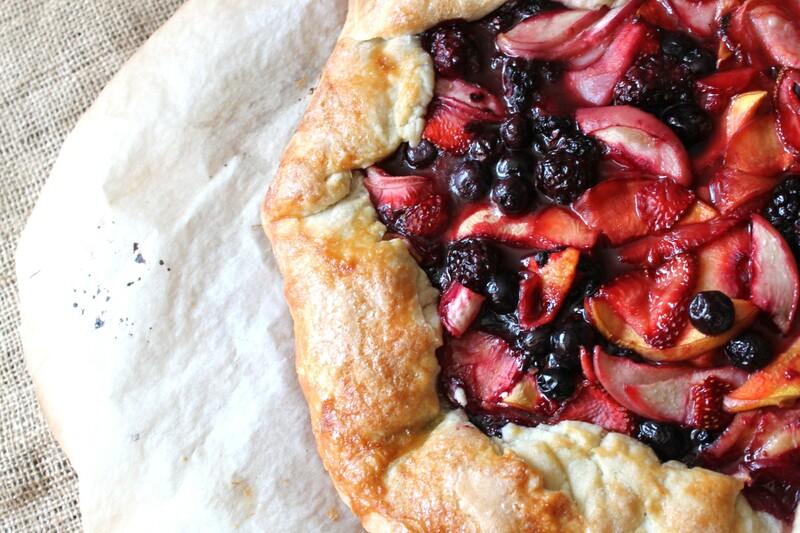 Fold the pastry border up and over the fruit, pleating it as necessary. Brush the egg white on the pastry and sprinkle with sugar. Bake for about 55 minutes, until the pastry is golden brown and the filling starts to bubble. 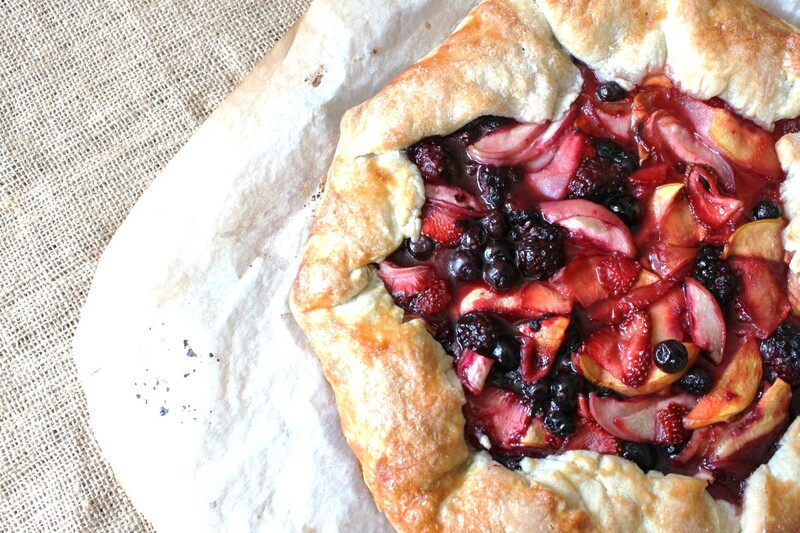 Transfer the baking sheet to a rack and let the tart cool to warm. Cut into wedges and serve warm or at room temperature.